Tony Allen, 2016 Diversity Distinction in PR Awards winner, recalls the special evening last year when he was named Diversity Champion - In-House. In doing so, he underscores why diversity and inclusion is so crucial to all of us, all the time. 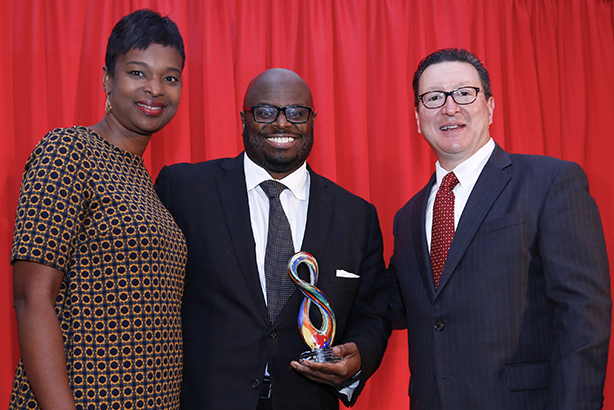 Being named Diversity Champion – In-House as part of last year’s Diversity Distinction in PR Awards was quite an honor – not just for me, but also my Bank of America family. Receiving the award was made even more special because I was joined at the PR Council annual dinner that evening by three interns-turned-teammates who came through our diversity pipeline program. As you well know, Bank of America has come under some criticism since the financial crisis. Some of it was warranted. And while it has not always been easy to admit that, our company has grown from it in ways that matter. One of the most significant lessons has been in the area of diversity and inclusion. I don't just mean in the images we promote, the organizations we fund, or the goals we have for a better, more inclusive world. I mean at the very fabric of our business – how we make decisions, who is a part of those decisions, and what impact those decisions have on the clients and communities we serve. That is in our DNA now and connotes certain responsibilities that you would – and should – expect of a 21st century Bank of America. So when I tell you ours is among the most diverse Fortune 500 company boards in the world, or that 40% of our senior management team is comprised of women, or that more than a third of our U.S. workforce is comprised of black and brown Americans, I don’t say it to boast or to wave the Bank of America banner. I do it because I would assume — we all should assume — nothing less than that from any major company in America. That is why Wednesday, September 21, 2016 – the night of the PR Council dinner at which I was honored – holds such a special place in my heart. My son, AJ, joined me that night. He is a recently graduated double major in communications and finance from Syracuse’s Newhouse School of Public Communications and Whitman School of Management, respectively. He now works for JPMorgan Chase in its management-development program. In 2014, when AJ was just a sophomore, I noticed the cover of PRWeek celebrating its Power List. The list was mainly white and mostly male. As I looked through the issue, there were just a few references to a few executives of color in the field. "My son is a rising junior at Syracuse’s Newhouse School of Public Communications. If he looked at this issue, would agency PR still seem like an appealing opportunity to him? One would think PR agencies would be diversity magnets for aspiring multicultural communicators. They’re not — and in large measure — neither are the Fortune 500 companies who hire them. This issue reminded me of that." After healthy exchange, in the next issue, Steve wrote a piece that thoughtfully critiqued the cover he had approved and more importantly the underlying issue. It was courageous, but we both agreed it wasn't enough. We concluded that "change comes with intention." And that, ladies and gentlemen, is the thing. That is why moments such as the Diversity Distinction in PR Awards dinner are so important. That’s why being a Diversity Champion means so much to me at my job, in my community, and among the great people I work with at my company and in my profession. We can’t be the change we want to see in the world and have complacency win the day. We owe it to our craft, our clients, our communities, and our country to do better, every day, in every way. Tony Allen, head of corporate reputation at Bank of America, was named Diversity Champion – In-House as part of the 2016 Diversity Distinction in PR Awards. Click here for thoughts from Pat Ford, worldwide vice chair and chief client officer at Burson-Marsteller and 2016 Diversity Champion – PR Agency, on why we all need to be diversity champions. The PR Council and PRWeek encourage you to enter for the 2017 Diversity Distinction in PR Awards. Check back on prweek.com in late April for all the details.